This article illustrates the new features of Jetpack and how its features make development faster. 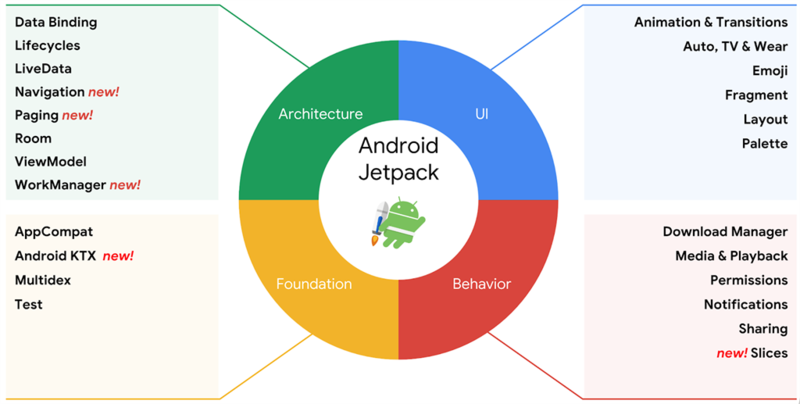 According to Google, "Jetpack is a collection of Android software components to make it easier for you to develop great Android apps. These components help you follow best practices, free you from writing boilerplate code, and simplify complex tasks, so you can focus on the code you care about." Jetpack contains certain package libraries called androidx. * and offers backward compatibility; however, these components update more frequently than the Android platform as promised by Google. Well, there are four Jetpack components released by Google in the documentation. These components offer some new excellent features to make Kotlin more usable and robust and make the work more productive. The four main components of Jetpack are listed below. We won't cover all of these features in this article. Let's take the first one, Data Binding, and let's go through the architecture component,i.e, used in the very first line in the queue. Data Binding is a library that enables the user to bind UI component without using findViewById(). It binds the data to Views in the layout using declarative format rather than programmatically. Let us see this using some code. Create a simple project and create a blank MainActivity.java. See the code below for better understating. Now, create a DataModel.java pojo class which contains the name and work. For the sake of simplicity, we are taking only two fields but you can increase your fields whenever you want. Clearly, we can see that here the commented code is before data binding, and after data binding you can see the difference. Don't forget to import "import <yourpackage>databinding.ActivityMainBinding " and most importantly, enable binding in gradle -- see code below. Now see here, without programmatically setting the data to the text view, you can bind the data using this method. We can conclude that Jetpack is the most versatile collection of libraries. With the example of data binding library, we saw how powerful Jetpack is. The beauty of the data binding library is that it eliminates the use of various lines of View initialization, like findViewById() etc. Now, data binding takes care of it. Stay tuned for other features. We will be here with more library descriptions and other Jetpack features.